The longer you’ve been in your current home, the more you may be considering refinancing your property. Knowing how to refinance a mortgage properly can bring you even more financial freedom by reducing your loan term and interest rate or adjusting the type of mortgage product you initially decided to go with. Your mortgage is likely the longest loan that you will ever have, so it makes sense that you would want to find the best mortgage refinance companies to assist you. With the proper tools, calculators, and customer service, the best home refinance companies can process your new mortgage in no time at all. Of course, it only makes sense to do this if it is going to save you money over the long-term length of your loan. The best home refinance companies should be able to tell you what mortgage products would work best for you. After all, you can opt for a new mortgage with an FHA loan, VA loan, USDA loan, HARP loan, jumbo loan or a conventional product. The best lender for refinance should inform you what would work best in your unique situation. To help you find mortgage refinance companies that can put you on the path to learning how to refinance a mortgage, AdvisoryHQ has put together a list of the top six best home refinance companies to make your search a little easier. 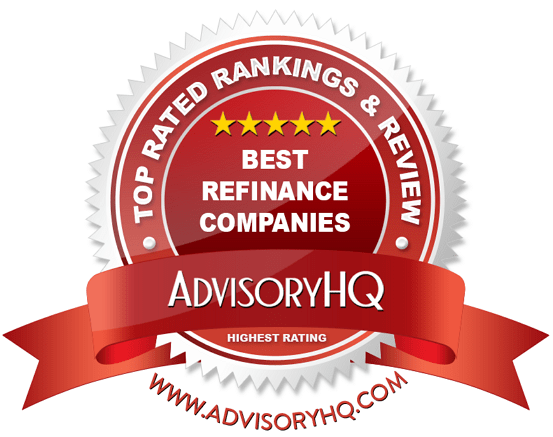 To assist you in your search for the best home refinance companies, AdvisoryHQ compiled this list of the top six best mortgage refinance companies based on a variety of criteria, including rates, product options, and customer service. For detailed information regarding which mortgage refinance companies made our list of the top six best refinance companies, keep reading. Over time, your mortgage may not be quite the fit that you thought it was when you initially purchased your home. The best refinance companies can walk you through which situations would work best for you, but a good starting place is to examine some of the main reasons why individuals might refinance their home. Some individuals may consider looking for the best mortgage companies to refinance with in order to cash out some of the equity in their home. This can allow them to perform remodels on their home, have extra spending money for large upcoming purchases or consolidate some of their debt on high-interest-rate credit cards. Others will search out the top refinance companies in order to lower their current interest rates. Over the course of a thirty-year loan, even a 0.5 percent interest rate reduction can add up to thousands of dollars in savings. You can also use refinancing to eliminate your private mortgage insurance if you were unable to come up with a down payment sufficient enough to avoid this fee during your initial closing. Refinancing could allow you to use the equity that is built into your home to create a new mortgage without private mortgage insurance as one of the necessary terms and conditions of your loan. There are plenty of refinance mortgage companies available to help you with your loan, no matter what your reason for refinancing. The best lender for refinance will be able to help you find a product that will work for your situation and needs. It isn’t hard to learn how to refinance a mortgage with the best refinance companies. While Amerisave is now generally considered one of the top rated refinance companies, it hasn’t always been that way. Its previous track record was less than squeaky clean when the Consumer Finance Protection Bureau found it to be at fault for posting misleading interest rates and illegally overcharging for third-party services. Back in 2014, the company was forced to fork over a grand total of $19.3 million which included a $14.8 million consumer refund. With two years’ worth of time distancing it from its transgressions, Amerisave has worked hard to establish itself again as the best lender for refinance and online home mortgages. Consumers now claim to be highly satisfied with its quality of customer service and the fees associated with its programs, which is why we have decided to continue to place Amerisave on our list as one of the best refinance mortgage company options available. For more information on how Amerisave landed on our list of the best refinance mortgage companies available, see below for a brief overview of its services. Through Amerisave, you can opt for either a rate and term refinance or a cash-out refinance depending on your situation. Like many of the best mortgage refinance companies, it can assist you in either reducing the interest rate or term of your original loan, or it can allow you to withdraw the equity from your home and transform it into cash. Depending on the complexity of your unique situation, your mortgage could be refinanced in as few as 14 to 60 days from the time of your application. Since Amerisave is a direct lender, it is able to process through more loans in a faster time frame than a broker may be able to. This makes it one of the best mortgage companies to refinance with. When attempting to qualify, the minimum credit score through Amerisave for conventional products is 620. However, if you are financing with a different type of product (including FHA, VA or USDA loans), the minimum credit score could be as low as 580. These rates are fairly typical among the best mortgage companies to refinance with. It likely will not be a decision-maker for you to go with Amerisave based on its credit qualifications. In terms of fees, Amerisave is one of the top refinance companies because of how little it requires in upfront payments. Unlike some other companies that may collect application fees, closing costs, appraisal costs, and more, before ever beginning your paperwork, Amerisave collects only the appraisal fee. The best refinance companies don’t typically want a ton of money upfront. However, the cost of an appraisal can run well into a few hundred dollars, so it makes sense for mortgage refinance companies to request this sum in advance. Beyond being one of the best refinance lenders available, Citigroup is also well-known for its personal banking that serves over 100 million customers over the span of 24 countries. It provides credit card solutions, retail banking, and commercial banking to meet a variety of consumer needs, as well as business needs, in addition to mortgages and refinancing. If your home has gone down in value and your appraisal concludes that the property is no longer worth what you originally thought, many lenders will no longer consider you as an applicant. However, CitiMortgage offers refinancing through the Home Affordable Refinance Program (HARP) that may allow you to qualify. This unique offering is part of what makes it one of the best companies to refinance home loan options through. Freddie Mac or Fannie Mae received your loan on or before May 31, 2009. Your mortgage payments are current (no late payments in the past six months and zero to one late payment in the last twelve months). You can afford the new refinancing payments. 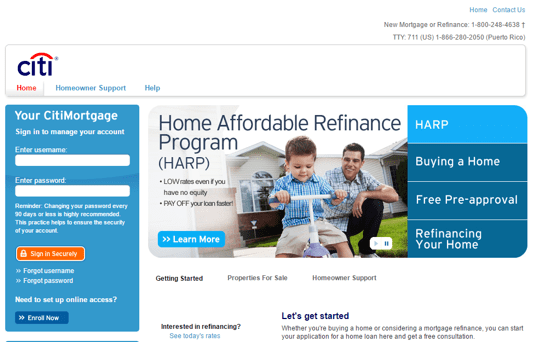 You haven’t previously refinanced under HARP. If your appraisal doesn’t meet the standards or you don’t qualify for HARP, you can also look at refinancing with an FHA loan or a VA loan. CitiMortgage does require some fees to be paid up front with your application. It claims that these fees (of an unspecified amount) are to cover the cost of initially processing your loan and pulling your credit report. Pulling a credit report is typically not a pricy endeavor, so fees should be minimal, which makes this potentially the best refinance mortgage company. Of course, you will still need to cover your origination fee, title insurance, new closing costs, and other usual fees you would expect from even the best mortgage refinance companies. Many of the best mortgage companies for refinancing are online-only options. While these are great for individuals who prefer to save time by not visiting a branch or setting up face-to-face meetings and for those who just prefer to do things at their own convenience, some people still prefer the traditional method of meeting with a live person. Since Citibank is such a large entity, you do have the option of visiting one of its thousands of branches to meet a representative in person. Without many of these options on the list of the best refinance companies, this definitely sets CitiMortgage apart as one of the best refinance lenders. Alternatively, if you still prefer to do most of your work online, you can begin the refinancing application process online or over the phone during its extended business hours: Monday to Friday from 8:00 AM to 10:00 PM and Saturdays from 9:00 AM to 7:00 PM (ET). loanDepot is one of the up and coming online lenders that specializes in delivering mortgage and refinance options to consumers. 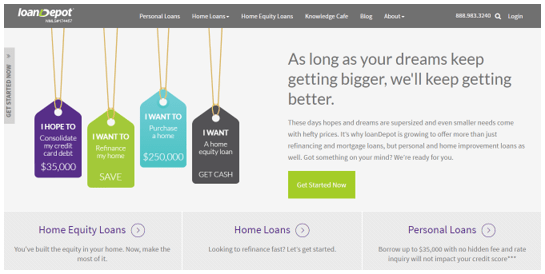 Founded just a few years ago in 2010, it quickly established itself as one of the best refinance companies. To prove that it was the best refinance mortgage company, it worked hard until it was named the nation’s second largest nonbank consumer lender and retail mortgage lender. While it may be an online-based business, giving busy individuals every opportunity to do their refinancing via the Internet, it has other options as well. You can schedule an appointment at one of its over 150 loan stores across the country if you prefer to do your business face to face. See below for some of the compelling reasons that loanDepot was named as one of the best home refinance companies for our list of top rated refinance companies. Much like CitiMortgage, the HARP program and the combination of other choices means you should have no problem discovering a mortgage option that would work for your refinance. loanDepot is not forthcoming with the minimum credit score it accepts for its traditional mortgage products. However, if your credit has a few blemishes, you may still find that you could use refinance mortgage companies to obtain a government loan that sometimes allows for looser standards where your credit is concerned. Like most top rated refinance companies, loanDepot does not charge an application fee. However, it does include standard fees that you will need to foot the bill for: credit reports, title work, escrow, and appraisal fees just to name a few. If you have built up plenty of equity into your home, loanDepot (like most of the best mortgage refinance companies) will allow you to bundle those costs into your new loan. LoanDepot is one of several mortgage refinance companies that services and funds its own loans. As a result, its turnaround time is faster than you might imagine. It claims that most of its transactions will close within thirty days from the time of your application (provided you do your part in delivering necessary paperwork). From the time your loan documents are delivered, closing should happen within five days. For those who are doing a cash-out refinance, the funds from the equity in your home should be delivered approximately one to three days after closing. As of June 2016, Nationstar was one of the top refinance companies, servicing over $369 billion in consumer home loans. In fact, it is one of the largest independent loan service groups in the United States. It works across the nation, giving you a wonderful nonbank online lender to consider on your list of the top mortgage refinance companies. It has received plenty of positive reviews through both LendingTree and Consumer Affairs. On both sites, its consumer reviews have left the company with an outstanding four-star or higher rating out of a total of five, clearly enabling it to become one of the best home refinance companies to refinance with. Below are excellent reasons why Nationstar has been added to AdvisoryHQ’s ranking of the best home refinance companies. Like all of the best home refinance companies, Nationstar provides plenty of refinance options to help you meet your goals. Whether you are looking for mortgage refinance companies that can help you to lower your rate, alter your term, switch to a fixed-rate or adjustable-rate mortgage or cash out your equity, Nationstar can do it all. It can help you figure out how to refinance a mortgage with an FHA loan, VA loan or Jumbo mortgage as well as through conventional mortgage products. One of the important things to note about Nationstar that sets it apart from many of the best refinance companies to refinance home loan options through is that it offers USDA loans as well. This is a unique offering among many refinance lenders. If you aren’t quite sure where to go with mortgage refinance companies, Nationstar provides an excellent starting point with a variety of calculators to determine what you can borrow, how to manage debt, how to lower your monthly payment, and just to see if you’re better off refinancing at all. This is a great way to evaluate if top refinance companies can be of any assistance to you as you walk through discovering what products may be the best fit for your new mortgage. If you still have questions after utilizing some of this information, you can fill out the online application form for a loan officer to contact you directly within 24 hours. Unlike mortgage refinance companies like CitiMortgage, Nationstar’s customer service line is available 24/7 if you have questions. The downside to its service is that it does not maintain brick-and-mortar locations, so you will have to complete all of your communication either via the website or customer service phone line. However, the accessibility to representatives day and night makes it easy and convenient to find a time to manage your refinance whenever you have the ability. SoFi calls itself a “new kind of finance company” with a “radical approach” to the lending it does. From student loans to mortgages to wealth management and investments, SoFi does a little bit of everything instead of boxing itself in as simply one of the best mortgage companies to refinance with. With a personable touch to its website, including colorful photographs of its extensive management staff and videos explaining the answers to frequently asked questions, SoFi aims to make its Internet-based business feel more personal for those who prefer traditional face-to-face interactions. Find out what sets SoFi apart as one of the best companies to refinance home loans through with these convincing reasons below. One of the greatest features that sets SoFi apart from some of the other mortgage refinance companies is its pre-qualification process. It will allow you to fill out a short application prior to jumping into a lengthier and more detailed version to see if and what you would pre-qualify for. Fortunately, it does not charge any application, origination or other lender fees which definitely sets it up as potentially the best lender for refinance. Many of the best refinance mortgage companies waive an application fee (or at the very least charge only for the credit reports they had to pull). Not many can say that they also waive your origination and lender fees. If you don’t want to add an additional expenses into your new loan at closing or you don’t have the cash to pay for those items, SoFi is definitely worth considering. Unfortunately, while SoFi may be the best refinance mortgage company around, the areas it services might not include your state. The other best mortgage refinance companies on our list cover most (if not all) of the continental United States. SoFi is only licensed for mortgage origination in 26 states. If you’re outside of its eligible territory lines, you’ll have to start considering other mortgage refinance companies instead. You can see the full list of states it services here. It does not appear that SoFi will offer any of the government-backed programs such as the FHA loan. In fact, it says that its minimum down payment is 10 percent – well above what you would need to bring to the table at closing for an FHA loan. You may be saving some money with origination fees, but bear in mind that your overall required down payment may be higher than what you would anticipate with other mortgage refinance companies. Wells Fargo is one of several well-known top refinance companies. It offers nationwide access to branches and has a long history and reputation for providing quality products. While many of the new up-and-coming best refinance lenders are online or nonbank lenders, Wells Fargo has maintained its status as one of the best refinance companies and as a large financial institution. See why Wells Fargo made our list of the best home refinance companies available. As one of the best companies to refinance home loan options through, Wells Fargo provides a number of ways to improve your current mortgage situation. You can work towards paying off your mortgage sooner, reducing your interest rate, lowering your monthly payment or converting to a fixed-rate mortgage. To help you figure out which option is best, its customer service representatives can walk you through the process to see which of its loan options would work best for your situation. You can fill in information, such as the value of your home, your existing mortgage balance, current interest rate, and insurance and property taxes for the year, to help you discover what other options you may have for refinancing. As possibly the best lender for refinance, Wells Fargo will take it all into consideration before helping you figure out your next move. Traditional individuals who prefer in-person interactions will likely prefer Wells Fargo to several of the other best mortgage companies for refinancing. Wells Fargo branch locations are available in most U.S. cities or at least relatively close so that you can stop in for advice, applications or to process through some of your loan paperwork. Alternatively, if you still prefer to do things online or over the phone, Well Fargo provides that option also. Its flexibility with communication is what makes it one of the best mortgage companies for refinancing. Unfortunately, its phone lines are not available 24/7, with only extended business hours through the week. Still a benefit over some of the best refinance companies, like CitiMortgage, it also offers hours for you to call on Sunday afternoons in case the rest of your week is too busy. Much like Nationstar, Wells Fargo also provides a number of calculators and checklists to make sure that you are on the right track with a refinance. It will help you figure out how to refinance a mortgage, what you can expect your rate and payment to be, and to make sure you can assemble all of the necessary paperwork in advance. Refinance mortgage companies that offer these services are great because it allows you to see where you stand financially prior to having to interact with a customer service representative. Each of our top rated refinance companies offers different solutions for how to refinance a mortgage properly. Your circumstances and financial situation will determine which of the mortgage refinance companies and loan options might be best for you. Whether you’re searching for a conventional loan, an FHA loan or a jumbo loan, there are plenty of refinance mortgage companies available for you to choose from. What is your goal with refinancing and finding the best refinance companies? How do you prefer to communicate with your mortgage refinance companies? What sort of down payment are you looking to make during your refinance? These questions will put you well on the path to accurately assessing whether the time is right for you to refinance and which of these best home refinance companies will work with you.